Most people consider Monique to be shy. At work, she never joins others in the lunch room. She stays at her desk, sneaking a sandwich while working. She avoids networking parties because she feels anxious about meeting new people. It is hard for her to make eye contact with others and her mind goes blank when she attempts to make small talk. She has few friends, never dates and rarely picks up the phone when it rings. Social situations make Monique sweat profusely, her heart race, she starts to shake and she gets a sick feeling at the pit of her stomach. She constantly chastises herself after talking to someone, thinking she should have said something different. Monique has social phobia, also called social anxiety. Can you relate to Monique’s situation? If so, you do not have to go through life, barely coping, with fear of social situations looming in the background. You can implement a social phobia treatment program and eliminate social anxiety forever. The portion of the brain, called the amygdala, is the cause of social phobias. Your amydala has memorized your reactions of fear to prior social situations, so that you automatically feel anxiety for each potential or actual social interaction. Your brain is dynamic and constantly develops. Maybe at a young age you experienced an embarrassing moment in front of people. Instead of being able to let it go, you dwelled on it continuously, shaping your brain to feel anxious about future embarrassing social situations. Just as your brain was modified to accommodate social anxiety, it can change to overcome social phobia. You are actually capable of reprogramming your brain so that it only reacts when there are actual dangers, like a fast-approaching car, and not irrational threats. Through changing your brain, in combination with using self-motivation and learning how to deal with stress, overcoming social phobia is a possibility. 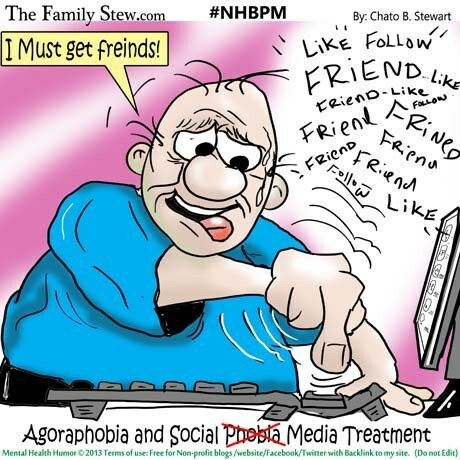 The first step to social phobia treatment is identifying what sets off your social anxiety. You must be as specific as possible. For example, instead of simply acknowledging that being amongst a group of people causes angst, determine what specifically causes your social phobia. Maybe it is being in a room with many strangers where you have a fear of introducing yourself to them. Once you start to identify specific triggers, you must consciously classify these situations as “false alarms”, realizing that they do not pose a real threat. This is how you begin to retrain your brain. You can continue to reprogram your brain by immersing yourself in these trigger zones. If you happen to be in a room of strangers, avert your focus from your internal anxiety to exterior conditions. Let your senses pick up on the music in the background, the décor, the actual taste of the hors d’oeuvres and the mannerisms of people in your company. You probably practice some avoidance techniques to make yourself feel safe. This actually increases your anxiety in the long run, making you feel more panicky when you may not be able to avoid that situation. For instance, if avoiding eye contact is part of your regular safety routine, it will be much more difficult when you have to make eye contact at a job interview or an important business meeting. By thinking of some of your avoidance techniques and starting to eliminate them one-by-one, you will be taking a huge step towards overcoming social phobia. To overcome social phobia, you must also envision yourself as confident and then act this way in social situations, while reminding yourself that your anxious thoughts are just “false alarms”. To help you feel more confident about yourself, you should get rid of false thoughts regarding your social anxiety. One common misconception is that people will notice your symptoms of social phobia. You may think that your sweating, shaking or blushing is obvious, when in most cases it is not. Another falsehood is that social embarrassments are the end of the world. In fact, everyone makes social mistakes, because we are all human. Learning to forgive yourself and realize it is acceptable to make mistakes is part of overcoming social phobia. Acting confident can start off as being played out in short bursts. For example, at the next meet and greet, tell yourself you will introduce yourself to one person. You will make eye contact with him or her and show a genuine interest in him or her through your own body language and verbal cues. By completely focusing on the other person, through asking him or her questions and actively listening, you will forget about your phobic reactions. These short little practice runs of exposure, where you act sure of yourself, will actually make you feel more confident in social situations. You will begin to turn these short bursts of interaction into longer periods of socializing. The more you put yourself into these awkward situations, the less awkward they will eventually feel.